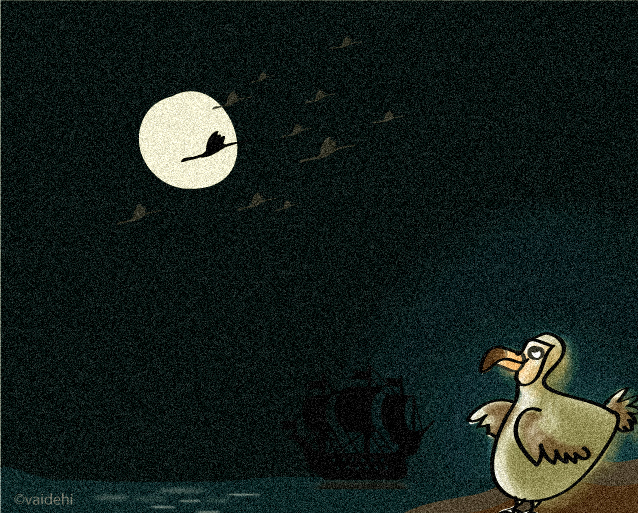 Once a shiny moon in 1681, a flock of gulls flew across the inky sky. Dodo watched in awe from her perch on the barge slip’s edge. Streamlined silhouettes cut across the orb. ‘Whoa, whoa, whoa. What lucky things. Such pretty wings,’ Dodo gushed, panning her bucked and beaked head from west to east in slow motion. When the flock vanished, she hopped down from the splintery post and waddled to her nest under the leafless tree. She hopped around the collection of twigs and straw, disappointed. A lead ball zoomed from behind towards her grey bulk.